The 7th　International Conference on Scour and Erosion (ICSE 2014) was organised by the School of Civil, Environmental and Mining Engineering and the Centre for Offshore Foundation Systems at the University of Western Australia under the guidance of the Technical Committee 213 for Scour and Erosion of the International Society of Soil Mechanics and Geotechnical Engineering (ISSMGE). This biennial conference draws together leading academics, scientists and engineers engaged in scour and erosion research to present and exchange their latest scientific findings. These proceedings, together with the six previous proceedings dating from 2002, present a rare collection of technical and scientific developments in scour and erosion research which have been established over the last 12 years. 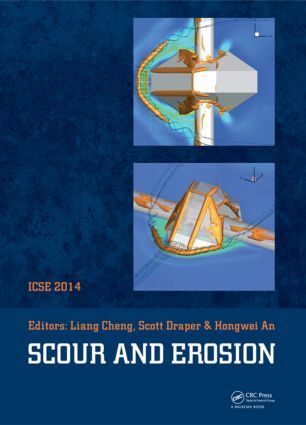 This book includes state-of-the-art papers in scour and erosion from ICSE 2014, covering the 6 themes of: internal erosion, sediment transport, advanced numerical modelling of scour and erosion, terrestrial scour and erosion, river/bridge scour and erosion, and marine scour and erosion. The proceedings include 5 keynote lectures from world leading researches cutting across the themes of scour and erosion, together with 87 peer-reviewed papers from 19 countries. This book is ideal for researchers and industry working at the forefront of scour and erosion, both with application to rivers and marine operations. High performance soft armour erosion control – How is this possible?! Liang got his BE from Tsinghua University in 1983 and PhD from Dalian University of Technology, China in 1990. He joined The University of Western Australia (UWA) in 1992 as a Research Associate and has been a Winthrop Professor in Civil Engineering since 2006. Liang’s research areas cover vortex-induced vibrations of offshore structures, sediment transport, flow/structure/seabed interactions and computational fluid dynamics (CFD) modelling of various industrial flows. Liang has published widely (about 200 publications) in his career and has won a number of government and industrial awards for his research contributions to offshore oil and gas industry. Scott has been an Assistant Professor at UWA (funded by the Lloyds Register Foundation) since September 2011. He completed a DPhil (PhD) in Engineering Science at the University of Oxford in 2011 on fluid mechanical aspects of marine renewable energy. Since commencing at UWA Scott has worked as part of a multidisciplinary team on problems of scour and sediment transport with application to stability design of subsea pipelines. Much of this work has been performed through the STABLEpipe Joint Industry Project. Scott has authored around 40 publications. Hongwei got his B.E. from Dalian Ocean University (China) in 2002, M.E. from Dalian University of Technology (China) in 2005 and PhD from The University of Western Australia (UWA) in 2010 and since then Hongwei has been working at UWA as a Research Assistant Professor through the STABLEpipe Joint Industry Project. Hongwei’s research directions include sediment transport, flow/structure/seabed interactions and numerical modelling of flow structure interactions.